Records in 1080i and 720p in DVCPRO/DVCPRO 50/DVCPRO HD with Up/Down/Cross conversion for playback (records 192 minutes in DVCPRO; 96 minutes in DVCPRO50; 48 minutes in DVCPRO HD). Also plays 24p content shot with the AG-HVX200 for extended record times (20 minutes of DVCPRO HD content can be recorded on a 8GB P2 card when shot in 720/24pn). Six card slots allow you to record a continuous, extended clip in sequence onto six P2 cards. 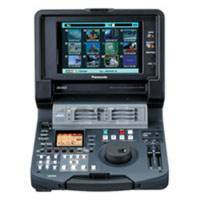 Or use five of the P2 slots for recording and use the sixth slot to output an edited playlist. A multitude of broadcast-level interfaces -- switchable HD/SD SDIs, IEEE 1394 (AVC), USB 2.0, analog, composite, HD component and four-channel analog audio. If you're shooting in HD, but need to connect to an SD or analog monitor, the P2 Mobile has all the inputs and outputs you need. Its USB input/output makes it easy to copy all or select clips to a disk drive simple. Connection of multiple devices is simple and creating dailies copies with time code for screenings is a snap.